Each step was agony. And it didn’t have to be this way. I mean, we planned better than this. Here I was literally stomping steps in the snow as my knees complained with each step. And yet, I shouldn’t have to do this. We’d summited Mt Baldy with a group of 6 Boy Scouts and one Cub Scout after about a three hour hike. The trail back to our gear descended along the north face. In North America the north face is the last to lose it’s snow. And there was still plenty of snow. We’d hiked through some of it on the trail on the way up. But, we had another idea for the trip down. You know, Rodney, you could ski down this mountain and cut a good hour off our return trip. The other leader was an accomplished skier. I’ve been skiing twice. Mostly so that I didn’t have to tell people I lived in Utah and never went skiing. No, it’s easy. You sort of set your feet and ski/slide down the snow. I can give my two boys permission to do it. And you could give your two sons permission. But, we’d need to ask the rest of the boys. When we explained it to them, the boys’ reaction ranged from enthusiastic to guarded agreement. The process is pretty simple. It’s sort of like running and sliding on the ice. Only you are going down hill, around trees, in the snow. For the first 75 yards the boys had a great time. At that point a couple of them decided they were done. The problem is that there was literally no where for them to go other than down. 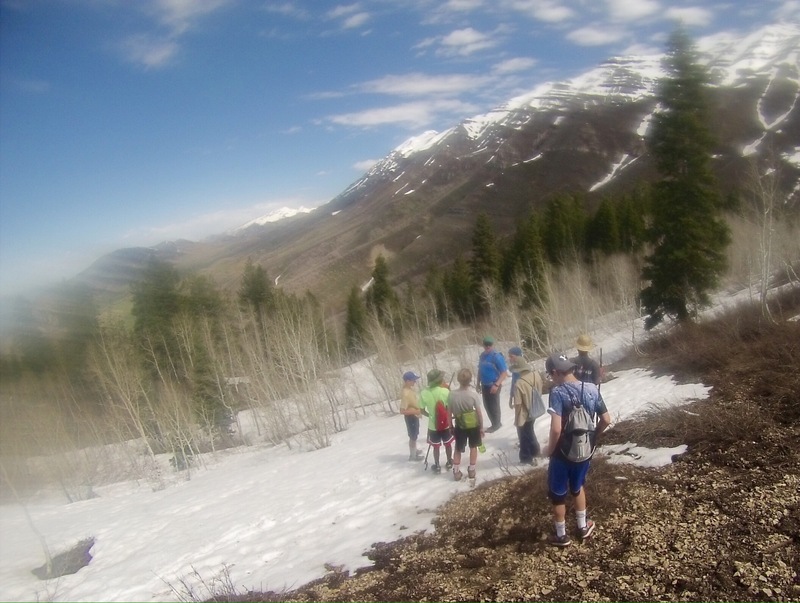 The trail was 75 yards up a very steep slide covered with snow. It was at this point that our entire adventure changed. Several boys darted ahead with the other leader. But, a group of three hung back and tried to gingerly pick their way down the slope through the trees and the brush on the side of the snow field. 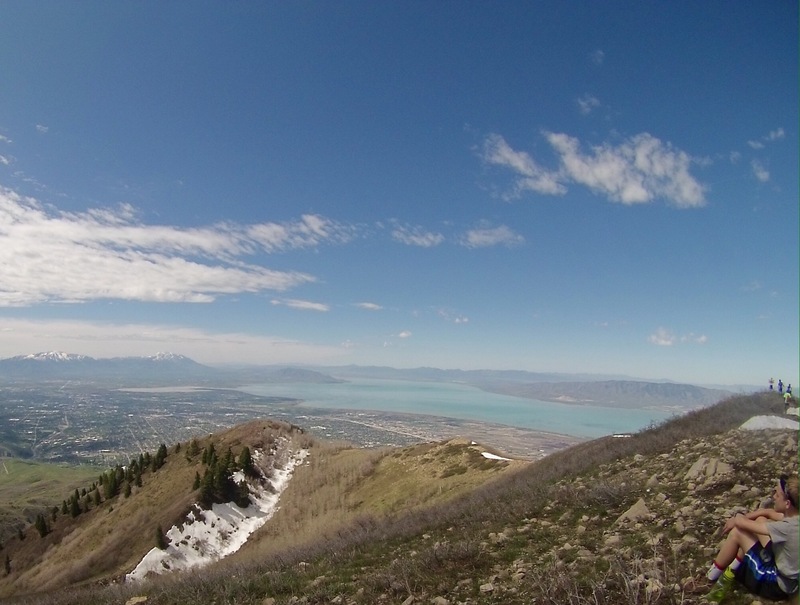 We were probably about a half mile above where we would intersect with the trail. The boys were going to have to push through until we got out of the snow and trees. Our quick shortcut had just turned into a much longer delay. No matter how much we encouraged them, the boys were not interested in sliding on the snow any more. Their hands were quickly torn up by the rough bark and sticks in the underbrush. My solution was to create a stairway for them. I walked out to the middle of the snowpack, where the sun had melted the top layer and began stomping steps. Just follow me, boys. Walk in my footsteps. Go slow and you’ll make it down just fine. I’ve had aching knees since I was a teenager. A years long bout of steroids to treat Crohns when I was 14 had left me with little cartilidge between the bones. I knew the hike was going to be painful, but this side trip was brutal. The snow was soft enough to break through, but I really had to dig my heal in to create an effective step. Knowing the boys were following, I intentionally made the steps close together. No more than six inches from the toe of one step to the heal of the next. I use a walking stick to take some of the load off my knees. However, I’d surrendered it to one of the boys to help him navigate the slipperly slope. The other boys were far ahead of us. Occasionally, I’d catch glimpses of them through the trees, or hear them laughing as one of them slipped and crashed into his friend. Meanwhile, I continued my slow, painful trudge down the mountain. I love working with scouts, but I was really struggling to remember that, as I built my snowy staircase down the mountain. Eventually, we saw the trail below us. I stomped my way to the edge of the snow. I think you boys can get there through the trees from here. I was beat. 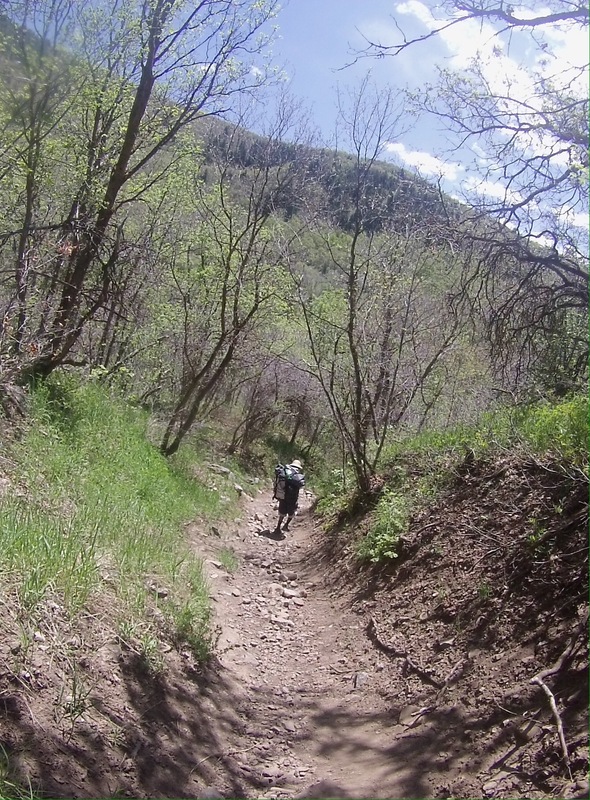 We still had five miles to get back to the trailhead at the mouth of Battle Creek canyon. I hobbled my way down. I’d retrieved my walking stick and used it as a crutch to lever myself down the rocky trail. It really was a wonderful trip. The weather, so terrible the last two years was gorgeous. The boys, several of whom were not sure they could go on at times, all made it to the top of the mountain and back down. Teaching a 12 year old that he can do hard things is always rewarding. The only negative experience for me was the trip through the snow. I enjoyed skiing down the first run. It would have been a blast to “ski” down the mountain instead of plodding along six inches at a time, while thrashing my knees. But, you can’t have everything, right? Take the good with the bad and all that. The next day I saw most of the boys at church. Our troop is associated with our church group. The boys were walking a little stiff. One of the mom’s came up to thank me for taking her son hiking. He was one whom I had really encouraged to push for the summit, promising him that it would be worth it. Gerry had a great time. He wanted me to let you know that the best part of the trip for him was when he was following along in your footsteps in the snow. He really appreciated that. Suddenly my knees felt a whole lot better. « Where Were You When?